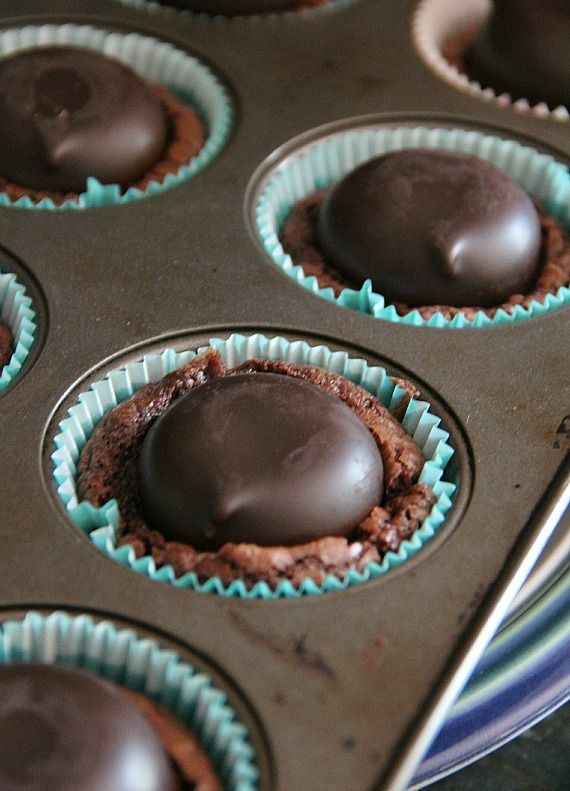 Mallomars or Whippet Cookies make these Mallomar Brownies something special! I just got back from vacation, which is nice and also stinky at the same time. Back to your own bed, your own pillow, your normal routine…all good. Having to actually do things like laundry, cook and vacuum…stinky. But also coming home from vacation means a whole lotta vacation-inspiration baking is gonna be happening in this here kitchen. So, while I’m busy baking up some stuff, you’ll have to settle for these super easy Mallomar Brownies. And might I just say that they ruled my world for the day that they lasted. I mean, you have a brownie, a cookie, marshmallow and chocolate all in one. For seriously serious. Make these as fast as you can! First mix up some of you favorite brownies. I used my fudge brownie recipe, but totally use what makes you happy…a boxed mix, Grandma’s recipe..whatever. The brownie is basically just the receptacle. 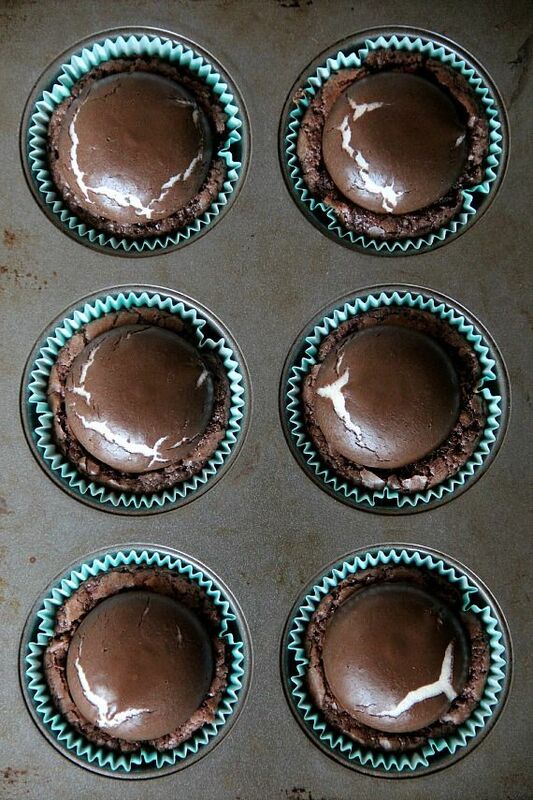 Line a muffin pan and fill your cups about half way. Bake those almost all the way. Meanwhile grab your Mallomars (or Whippets) and definitely sample for quality control. Pop them back in the oven for a few. They will puff and crack a little, which is a beautiful site. Whisk both sugars into the chocolate mix. Add in eggs, one at a time and then add vanilla. Whisk until combined. 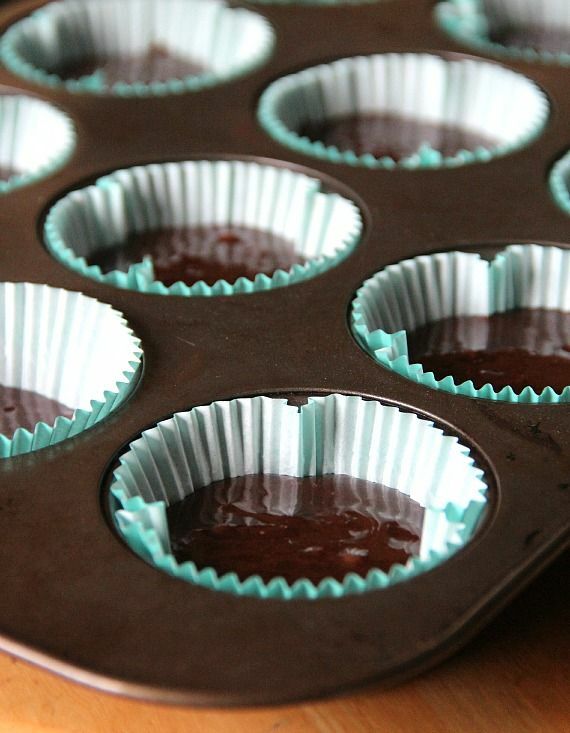 Stir in flour and salt until evenly incorporated and fill each liner with 2 Tablespoons of brownie batter. Bake brownies for 20 minutes. Remove from oven and press Mallomar cookie directly into the center of the brownie. Return to oven for 2-3 more minutes. The Mallomar cookie will puff slightly. Remove from oven and transfer brownies to wire rack to cool completely. 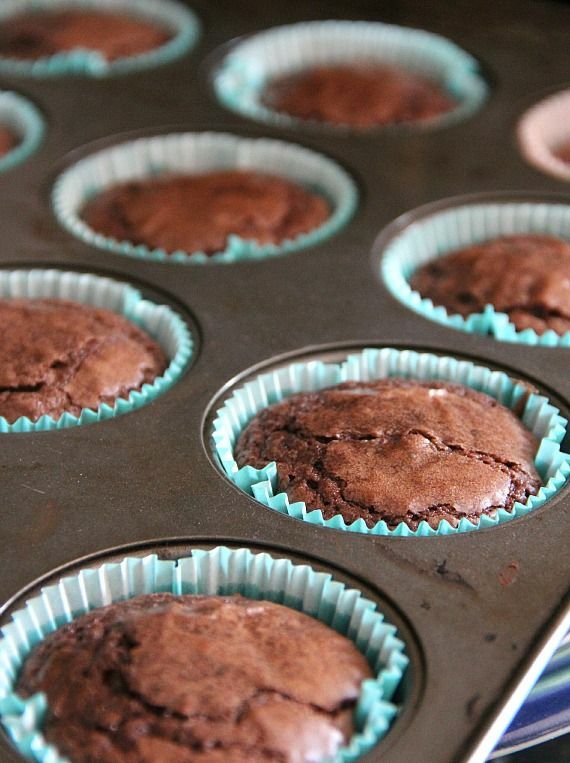 You can easily use a boxed brownie mix for these also! You be a genius. These are freaky good looking. A box of Mallomars last about 2 seconds in my house full of men … I’d have to go all Mission Impossible to make these delicious looking brownies! Every time I think of Mallomars I think of When Harry Met Sally and I just love that!! And really, there isn’t anything more perfect (at this moment at least!). I could eat this whole pan in one sitting hahaha looks great! Where are you that you can you buy mallomars at this time of year? They stop shipping them because they melt so we can’t get them again until the fall. Also, as much as I would like to make these, my kids scarf down those cookies so fast I have to buy multiple boxes and hide them away if I want even one! You have taken brownies to a whole new level with this one!!! Those looks absolutely amazing! Can’t wait to try the recipe. Oh have mercy I want a plate of these babies!!! Yum. Oh, my goodness, my boys are gonna love these! Thanks for sharing what goes on in your brilliant culinary mind! I don’t really like mallow-bars of any kind but I bet if I had them this way, they wouldn’t be so bad. They look awesome! Devilishly good. Wow. Just. Mm-hmm. These look like the perfect midnight snack. Heaven! These look so good! I’m not the biggest Mallowmar fan but I’d be down to try these. You know, I always did think mallomars were missing something chewy gooey chocolatey delicious in their mix. Genius! These are genius! Must make as soon as possible. Really, I want your cookie/brownie making brain. It is awesome! This is one great big phenomenal idea. 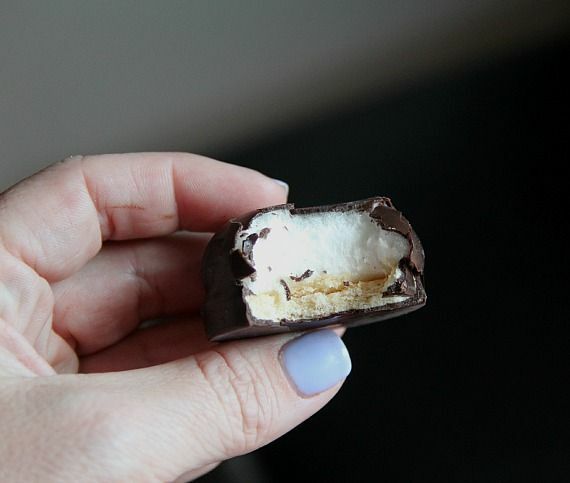 I never eat Mallowmars anymore just because I’ve kind of forgotten about them, but putting them in a brownie for s’more flair is the best possible way to eat them! Sadly enough, I have never had a Mallomar. I need to change that ASAP. These are little puffs of heaven!! Love this idea! Oh heavens to betsy, these look delicious! Although, I think there’s something wrong with those mallomars. You should send them all to me for quality control. I’ll report back the data. Oh, my gosh!! These look way too good! Yum!! These look delicious! I’m not sure I would be able to eat just 1! Those look almost too good to be true. Unfortunately, they don’t sell Mallowmars OR Whippets here in Arkansas ( BOOOOOO ), so I’m going to go cry now. IDK when I last had a mallomar but I must have one in these brownies! Such fun, chocolaty and decadent little treats – I love ’em! I could down a dozen at least! Those cookies are great on their own, but I bet even better in brownies. What an awesome idea! This makes me want to turn on my oven on a hot summer day! These look so yummy……thank you! These are genius! As soon as possible. Really, I hope your cookie / brownie brain. This is awesome! I may have just made that Homer Simpson gurgling/drooling sound. Why do I never buy mallomars? WHY?! I’m going to be dreaming about this all week. vacation-inspiration baking and cooking is the best! I get some of my best ideas while on vacation! Love these! Do you think these would ship well? My mom loves mallomars and this might have to go into her Christmas box. Oh yes, I think they’d ship fine! Wow I bet they are delicious, can’t wait to try it! !